We’d love your help. Let us know what’s wrong with this preview of Mr. Dickens and His Carol by Samantha Silva. To ask other readers questions about Mr. Dickens and His Carol, please sign up. Did Standiford's "The Man Who Invented Christmas" have any influence on "Mr. Dickens and His Carol"? I haven't read either (though I'm more drawn to the latter), but it seems serendipitous that the movie of Standiford's book is coming out this Christmas. Just wondering is all. This books reads like it should be considered YA like so many other popular novels. Do you find that to be true about so many bestsellers? A sentimental and oh so charming read, but if one cannot be sentimental during this holiday season, when can one? Also another book coincidence since I saw this book after reading my friend Laura's review, and grabbed it. Last year I listened to the original Christmas Carol, while wrapping gifts. Seemed only fitting to read this one during this holiday, Christmas, which has come once again. I enjoyed this book very much. The writing, the descriptions, the character of Dickens himself, all very we A sentimental and oh so charming read, but if one cannot be sentimental during this holiday season, when can one? Also another book coincidence since I saw this book after reading my friend Laura's review, and grabbed it. Last year I listened to the original Christmas Carol, while wrapping gifts. Seemed only fitting to read this one during this holiday, Christmas, which has come once again. So the readers are taken along on a journey, Dickens own, a well done imagining of how this famous Christmas story came to be. A first novel, so talented a young author, atmosphere so true to the time, and follows much in the way of feelings of the original story. "Dickens laid down his pen. He didn't want to say goodbye, he wanted to keep them close, where he might watch over them. But he knew that the end of his book was a beginning of their life, without him, and he must let them be born into the world, and welcomed, as he felt sure they would be. Still, he was grateful to have known them at all." I have a difficult time reading some works of historical fiction that are based on real characters. My worst experiences are always when an author chooses to use scandal, innuendo, rumours, and gossip as though they are fact. So, I was a bit worried about how this book and I would get along. Much to my delight, this novel is a tender and loving tribute to Charles Dickens as Ms Silva tells her own story about how “A Christmas Carol” came to be. In her author’s note, she mentions that she appreciat I have a difficult time reading some works of historical fiction that are based on real characters. My worst experiences are always when an author chooses to use scandal, innuendo, rumours, and gossip as though they are fact. So, I was a bit worried about how this book and I would get along. Much to my delight, this novel is a tender and loving tribute to Charles Dickens as Ms Silva tells her own story about how “A Christmas Carol” came to be. In her author’s note, she mentions that she appreciated the work of Charles Dickens’ biographers; yet to tell the story she was moved to tell, she played “fast and loose” with people and situations in the book. I, for one, am very glad that she did so. I almost felt as though Ms Silva was channeling Mr. Dickens and/or his own spirit was at her elbow guiding the process along. This is a beautiful story, even bearing in mind the times about which it was written. In true Dickens fashion, her descriptive prose had me right there in the thick of London at the time: walking the streets with Charles Dickens, seeing what he saw, hearing what he heard, and the scents and smells of both poverty and comfortable lifestyles as vividly painted as if by the master himself. The story is not only inspiring and deeply moving, but it is also written with a gently robust energy to it and a subtle poetic flourish at times. I loved every word of this novel. As I mentioned before, at times, I truly felt as though Charles Dickens were dictating it. What an amazing experience to feel and sense all that he was experiencing – and with such authenticity. "I am not haunted by ghosts, but by the monsters of ignorance, poverty, want! Not useless phantoms that frighten people into… inactivity. I do not abide such nonsense." A Christmas Carol is one of my treasured favorites of the season. Whether it is the little book itself, a screen adaptation, or a live performance, it never fails to entertain and delight. When I came across the title of this book, Mr. Dickens and His Carol, I was naturally curious. At the same time, I was a little skeptical, worr "I am not haunted by ghosts, but by the monsters of ignorance, poverty, want! Not useless phantoms that frighten people into… inactivity. I do not abide such nonsense." A Christmas Carol is one of my treasured favorites of the season. Whether it is the little book itself, a screen adaptation, or a live performance, it never fails to entertain and delight. When I came across the title of this book, Mr. Dickens and His Carol, I was naturally curious. At the same time, I was a little skeptical, worrying that it would perhaps fail to do justice to the original. However, this is not a retelling of that work, but instead a very imaginative and wonderful fictional story about the days leading up to Dickens’ writing of this holiday classic. Furthermore, it is a very interesting peek at the writing process – the ups and downs as well as the inspirations of a grand storyteller. Sales of Martin Chuzzlewit have been plummeting, and Charles Dickens’ publishers are demanding a Christmas book to prevent the famous novelist from sinking to obscurity. But Dickens is not quite on board with this idea, and is initially rather resistant. However, with a growing family and a house to keep, Dickens needs the income and eventually agrees to write a Christmas story. He takes to the streets of his beloved London for inspiration. "A map of it was etched on his brain, its tangle of streets and squares, alleys and mews a true atlas of his own interior. The city had made him. It knew his sharp angles, the soft pits of his being. It was a magic lantern that illuminated everything he was and feared and wished would be true. It was his imagination – its spark, fuel, and flame. From the highest Inns of Court to the lowest crumbling slums, Dickens had found his writing here, filled his mental museum with all that he’d seen and smelled, heard and felt worth keeping." Author Samantha Silva vividly brings to life the city and its inhabitants. She allows us to see through the eyes of the brilliant writer. I always assumed something like A Christmas Carol would have been a quick and easy ‘assignment’ for an author such as Dickens. Not so… We see a man struggling with the demands put on him by family and friends as well as his dissatisfaction with the superficial attitudes and commercial excesses of the season. His creative genius stalls and he is haunted by the fear he will not be able to invent a story to delight his precious readers. "The biggest terror of all was not being able to write, having no inspiration, no source, no reservoir of words and feelings, no one to prop him up or spur him on. No one to be his mirror, to reflect back what he thought he might be." As for Bah Humbug....not this delightful work of fiction. A Scrooge type is here though complete with a humbug attitude and many other familiar plot connections and characters from A CHRISTMAS CAROL. MR. DICKENS AND HIS CAROL is an imaginative and historically atmospheric debut that gives the reader a fictional glance of the past (with some truisms) of what Charles Dicken's' life might have been like while writing his finest book. Love the foggy London setting, the graveyard presence, little Timothy, and the ghosts of the past. Surprisingly WELL DONE Christmas read FULL OF HEART! Apparently this is the debut novel for Samantha Silva, but I couldn't tell. The prose is beautiful, and this was such a great, magical Christmas book. I pretty much read it in one sitting because I couldn't put it down. The story was incredibly vivid due to the descriptions, but I didn't feel like she was overly describing anything. Embarrassing fact: I have not read a single book by Charles Dickens, not even A Christmas Carol. I have seen the movie and the play, and that is it. However, I still really appreciated this book and loved every second of it. The writing style took me a bit to get used to, but once I got used to it the pages flowed quickly. This book was incredibly charming and it was a great little Christmas read at less than 300 pages. Charles Dickens was big family man he was very popular but he wasn't all that people knew .Dickens was an utter cad. He through his wife out & lived with Misstras a lot like his best friend Wilkie Collins who had two mistress & a wife. I have read Martin Chuzzlewit I did not think it was that bad but it was a flop. I read all but two of his books I always thought Domby & Son it was boring . This how he created The best novella of all time Christmas Carole. His books were not popular aft Charles Dickens was big family man he was very popular but he wasn't all that people knew .Dickens was an utter cad. He through his wife out & lived with Misstras a lot like his best friend Wilkie Collins who had two mistress & a wife. His books were not popular after he died & by the end if the 19th century had all but been forgotten but then C .K Chesterton the Author of Father Brown did a biography of him .Suddenly he was popular all over again & has never been out fashion since. His publishers tell him he has a flop America hate Martin Chuzzlewit so they brought out a hidden clause writ a Christmas story in 2 weeks in time for Christmas or we will fine you £40 per month. He has no chose to save his Bacon or he loss (£2500 in modern terms per month) .Oh & he has to put ghost in it too. This has very Victorian feel about, odd lot the Victorians at dinner party they had large jerry pot on top of the side board for use during a dinner party which the guest went behind a screen to use & then place back with cloth on top. Sounds disgusting but when think that dinner party could be six to seven courses with lot of wine & port .Ladies could not remove there huge dresses but just stuck under Neath & sat down. From soup,savoury,fish,meat,two lots of puddings ,welsh rabbit & nuts with wine then hours upon hours no wonder they needed a pee. It's the little things that make book stand out from others .Here Silva in Chapter 20 we have Dickens sat at Saracens Head for his breakfast 1 plate of beef, 1 plate of shrimp ,a suet pudding filled with kidney ,coffee & claret!!! We also have a talk about curry powder & Prince Albert's Tree. Another huge meal of roast beef,boiled pork, mutton chops, pigeon pie & rump suiet Steak pudding no wonder he died in his sixty's in fact it a wonder made 50. His father was always in debt & his brother too using his name to pay debts no wonder he created Scrooge he wanted to be him as we see here .This very funny but also interesting take on why the book came about but how much is true is for students of Dickens to decided . The only thing that don't like is the Old Curiosity shop comments if not read the book read it first as the end is mentioned number of times If have know what I am talking about & if you haven't I not say it's as River Song says Spoilers Sweety. I have read Christmas Carol number of times & Alister Sim is must every Christmas Eve on DVD but it a shame that I have had to read this in hot July but got out the of my local library it took weeks too come. Maybe it would be best for holiday weekend Christmas book instead of the Sound of Music for 300+ time. A Christmas Carol by Dickens has been my favorite book ever since the first time I read the story as a child. I re-read it every year and watch every movie version from Alastair Sim to the Muppets. :) When I heard about this book, I knew I had to read it. :) I'm glad I did! First of all, don't confuse this book with the book or movie "The Man Who Invented Christmas''....that is another story by another author (Les Standiford). Standiford's book is non-fiction, telling the tale of how A Christmas A Christmas Carol by Dickens has been my favorite book ever since the first time I read the story as a child. I re-read it every year and watch every movie version from Alastair Sim to the Muppets. :) When I heard about this book, I knew I had to read it. :) I'm glad I did! First of all, don't confuse this book with the book or movie "The Man Who Invented Christmas''....that is another story by another author (Les Standiford). Standiford's book is non-fiction, telling the tale of how A Christmas Carol reignited Dickens' career. This book -- Mr. Dickens and His Carol -- although it contains some factual information here and there, is a work of fiction. Silva states at the end of the book that the story is a re-imagining of how A Christmas Carol was written. It's meant as an homage to Dickens, not as a factual story. I read and enjoyed Silva's book with that in mind. I read this book wrapped up in my favorite fuzzy purple blanket, a cup of hot Earl Grey beside me, my fat cat asleep on my lap, and Alastair Sim in the movie A Christmas Carol (1951) playing in the background for ambiance. Full on Christmas spirit goin' on around here. :) The only way I could have felt more Christmas-y would be if I had strung twinkle lights around my head before sitting down to read. I couldn't read a book about my absolutely most favorite beloved story without everything being just right. I wanted to enjoy every word. The minute I started to read, I couldn't put the book down. It's a delightful story! Before Alastair Sim as Scrooge pretended to fire Cratchit for being late to work after Christmas, I had devoured this entire book. I loved it! And the cover is awesome! It made this Dickens fan totally happy! Anyone who loves A Christmas Carol will enjoy this book. Just remember to read it as a work of fiction -- not a factual account. A Christmas Carol is one of my favorite works of fiction and I read it every Christmas along with the original Christmas story. It is said that it was written out of financial imperative, but whatever necessitated its writing, it is obvious that Dickens knew what Christmas ought to mean and brought that feeling to life in his fine tale. Which brings us to this lovely little debut novel by Samantha Silva. Silva caught the spirit of The Christmas Carol and put the same vivacity into her own imagini A Christmas Carol is one of my favorite works of fiction and I read it every Christmas along with the original Christmas story. It is said that it was written out of financial imperative, but whatever necessitated its writing, it is obvious that Dickens knew what Christmas ought to mean and brought that feeling to life in his fine tale. Which brings us to this lovely little debut novel by Samantha Silva. Silva caught the spirit of The Christmas Carol and put the same vivacity into her own imaginings. A thirty-one year old Charles Dickens, already a father of six, having enjoyed a kind of celebrity that few could boast of in his day, finds himself with a flop in Martin Chuzzlewit and is pressed by his publishers to write a Christmas story or suffer a loss of income. Already financially over-extended, Dickens has little choice but to comply, but can a writer produce a good book because it is demanded of him? Of course not, so Dickens needs some inspiration, which Silva supplies in spades. I hope to see many more novels by this extremely talented writer. She brings the foggy streets of London to life; I could feel the wisps of mist tugging at Dickens as he roams its backroads and famous thoroughfares. She sets a mood, much as the man she pays tribute to does, and I think he might be willing to tip his hat to her efforts. To sum it up in one word: Magical. A magical first novel by Samantha Silva. I feel like I've stepped out of a Christmas snow globe where Bumble's Toy Shop and Furnival's Inn are real and snowflakes are softly swirling around me. I didn't want the story to end. Christmas had been hiding in the streets all along. The Dickens children marched behind their father in obedient single file, but their eyes were bright and round as new pennies. ... The air smelled like it had hailed nutmeg and snowed cinnamon. The night was an embroidery of stars on a taffeta sky so blue it bled all the black away. No more drab-colored December fringed with fog. The eve of Christmas week burst into the world, clear and dry, the streets one continuous blaze of ornament and show. I love Charles Dickens in particular and Victorian novels in general, and so this book really called out to me. Although I loved the very beginning, a woman from Dickens's past is soon introduced, which made me cringe a bit, thinking this might go in a direction I hoped it wouldn't. But I read on and the book just got better and better. Once a young character (a young artist, actually) was introduced, he became quite important to the plot, and captured my heart so completely that it was hard to put the book down. I'd settled on a four star rating, but ultimately decided to bump it to a five because I absolutely loved the ending and because I'm now determined to: 1) learn more about the life of Charles Dickens and 2) read all of his works, except I'm really thinking now about reading them all in the order in which they were written. I alternated between the audio and paper book, and I just loved the audio performance by Euan Morton. The pacing was perfect and he changed voices such that I felt totally immersed in the story. A five-star audio performance, for sure. The one thing missing from the audio (and this is common) was the author's note. Since this is a work of historical fiction, I find it fairly important for the reader to understand where the line between fact and fiction was drawn. I hope more author's notes will be included in audiobooks in the future. Apparently this book was first written as a screenplay and almost made the cut to be made into a film. I would absolutely love to see this on the big screen. I think it would be wonderful. Hopefully the success of the paper book will drive this to reality. We need more books and films like this. We've already bought our Toys for Tots gifts this season, but I'm about to triple our purchases after reading this book. Generations of people have loved reading Charles Dickens' classic Christmas story because it shows us the spirit of giving to others. Even characters like Ebenezer Scrooge may have had events in their past that led to their cold-hearted ways, and there is always time for second chances in life. Samantha Silva has used her knowledge of Dickens' life to imagine what inspired him to write his most famous novel. Dickens was in debt since his previous novel had not sold well. His wife was spending mon Generations of people have loved reading Charles Dickens' classic Christmas story because it shows us the spirit of giving to others. Even characters like Ebenezer Scrooge may have had events in their past that led to their cold-hearted ways, and there is always time for second chances in life. Samantha Silva has used her knowledge of Dickens' life to imagine what inspired him to write his most famous novel. Dickens was in debt since his previous novel had not sold well. His wife was spending money lavishly decorating their home, and planning a large Christmas party. His relatives were asking for loans, charities were requesting donations, and his children had wishes for Christmas toys. He had less than a month to write a short Christmas novel, but was plagued with writer's block. Dickens took long walks through London, observing people ranging from the affluent to the destitute boys living on the street. He met a woman, Eleanor, who acted as his muse. She also introduced Dickens to her son, Timothy. Dickens' imagination took off, and he rapidly wrote "A Christmas Carol". MR. DICKENS AND HIS CAROL by Samantha Silva - Thank you so much to Flatiron for providing my free copy - all opinions are my own. I’m not one to read Christmas books but I love historical fiction so I desperately wanted to read this. It’s a charming debut novel with beautiful prose and vivid descriptions. I could see the town and picture the people in it. The author did a fantastic job showing the complex and wonderful character of Charles Dickens - he’s flawed but very endearing. 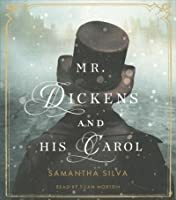 I love how the MR. DICKENS AND HIS CAROL by Samantha Silva - Thank you so much to Flatiron for providing my free copy - all opinions are my own. I love how the author seamlessly tied this book to Dicken’s masterpiece, A Christmas Carol. And I absolutely adored the ending. This is a very fast, compelling read - at under 300 pages and with short chapters, it can easily be read in one sitting. I highly recommend it to anyone who enjoys historical fiction and/or who is a fan of Charles Dickens. But, you don’t need to be a Christmas junkie to enjoy it - it’s very well-written and anyone who appreciates a good story will love it! This life is to short to read mediocre books and novels!! An here with "Mr. Dickens and His Carol" by Samantha Silva we have indeed a great and beautiful written debut novel..
Let me tell you, if you love Dickens, then this is it!!! Samantha Silva knows how to web a spell in her narration that binds and enchants the reader. She resurrects and evoke in her novel Dickens world and characters.. They are described so mightily that they will be hunting you in your imagination and even dreams long after ha This life is to short to read mediocre books and novels!! They are described so mightily that they will be hunting you in your imagination and even dreams long after having read this..
During my readings I had the impression to walk with Dickens trough the streets and even to see the buildings and the mysterious creatures lurking behind the corners in the midst of the so famous mist by night!!! The literary hints at Dickens and his other work are deliciously crafted!! But this is also a novel about the spirit of the Christmas season..
With a ghost, and an unexpected end!!! I'm so thankful and lucky to have pick this one up, I loved it..
Full recommendation to every single one of my goodreads friends!!! All right, I did my book club duty & read this book. First, I'll say that quite a few people might enjoy this book. I can see a certain appeal in it. If you want an easy, Christmas-y book with a Victorian London setting, this might fill a night or two by a roaring fire with a hot drink. (Well, except for those of you in the Southern hemisphere.) The writing level itself is okay. I even had a tear or two forming by the end. (But, I'll cry for sappy commercials or jingles, so take that comment All right, I did my book club duty & read this book. I'm sure you knew this next part was coming.... Feel free to call me Scrooge & a cynic as I go into further detail about why I didn't really care for this book. It's just not my type of book. Period. It was a book club choice, so I tried to get over my Scroogeishness & just read the darn thing in the spirit of being a good book club member. At least I finished it. Part of my grumpiness is that I don't like Charles Dickens' books much (if at all) & the other part is that maudlin stories are not my style of book. My idea of Christmas fun is to watch Die Hard, so the traditional type of Christmas tale isn't at the top of my list of favorites. There's a whole Bob-the-cat, now a letter opener thing that was bothersome. This is my own issue & not particularly pertinent to this actual book, but it is somewhat pertinent in that Silva does mention letter openers a few times (including Dickens using the letter opener to clean under his fingernails). For background on my strange aside, look here: Charles Dickens Gave His Cat “Bob” a Second Life as a Letter Opener. Yes, it's real. I saw it in person at the NY Public Library a few years back. The photo in the linked article makes it look better than it looked in real life (which was looking pretty mangy). A side note: I know paper sizes were different back then, but this letter opener is really large -- like the size of a dagger. Was that normal? The entire thing was so strange when I saw it. I adore cats. I adore that Charles Dickens loved cats too & had deaf Bob as a favorite. But, but.... I am haunted by Bob the cat's taxidermied arm as a letter opener handle. Every mention of a letter opener or a cat in this book brought Bob the letter opener to mind. To be fair, this is not Silva's fault. In relation to the comments in #4, yes, I fully realize this was a trope where he was supposed to be Scrooge-like, thus setting him up for his epiphany at the end. If you like predictable, I guess that's fine. I found it ho-hum. The "plot twist" was... I'm not even sure what to say. Probably predictable (I hadn't really thought about it prior to the reveal), but really just kind of silly in a way, just another way to reinforce the tropes. A theme of the book was an argument against the commercialization of Christmas, the over-consumption, the greed. Guess what? The finale results in them having their annual extravaganza -- an always better than last year's (must always strive to outdo oneself every.single.year), more expensive, more decorated, more flashy, more food, completely over-the-top party like they always do. Guess they're not good at learning their own lessons? Or, it's ok if you're giving money to charity & telling people "Merry Christmas" while continuing to overly indulge in your commercialized Christmas? *3.5 stars. For those of us who have enjoyed Dickens' A Christmas Carol many times throughout the years, this is 'meant as a playful reimagining of how the second most beloved Christmas story in the world came to be.' Beautiful descriptions bring the reader into the midst of that era, a society with both poverty, hunger and want and lavish, extravagant lifestyles. (Sounds similar to the modern era, doesn't it?) Charles Dickens has been the darling boy of the reading public and his publishers unt *3.5 stars. For those of us who have enjoyed Dickens' A Christmas Carol many times throughout the years, this is 'meant as a playful reimagining of how the second most beloved Christmas story in the world came to be.' Beautiful descriptions bring the reader into the midst of that era, a society with both poverty, hunger and want and lavish, extravagant lifestyles. (Sounds similar to the modern era, doesn't it?) Charles Dickens has been the darling boy of the reading public and his publishers until his latest work, Martin Chuzzlewit, falls flat in sales. Now Dickens finds himself overextended financially with the holidays fast approaching; his publishers are pushing him to write a story in time for Christmas sales. But Dickens is facing the terror of the blank page and is so feisty, he is alienating both family and friends. Where is his muse? He finds it in a most unlikely place. This was not a bad debut offering all-in-all but the story seems to drag a bit halfway through with too much of the same sort of things repeated (or was it just me and the hectic pace of the pre-holiday season?) but the heart-warming ending does redeem the book considerably. Indeed, Mr. Dickens. Ha! I was so hoping she would slip that line into the book somewhere. This was SUCH a great read. If you have a Christmas shelf, add this right away. The vernacular and setting are just whimsical and nostalgic. I can't get over the ridiculously awesome names that Dickens gave his characters, and the author plays on this in the best possible way in Mr. Dickens and his Carol. The story is life imitating art imitating life. In short, Dicken's story parallels Scroo "Bah! Humbug!" The vernacular and setting are just whimsical and nostalgic. I can't get over the ridiculously awesome names that Dickens gave his characters, and the author plays on this in the best possible way in Mr. Dickens and his Carol. The story is life imitating art imitating life. In short, Dicken's story parallels Scrooge's story. It actually reminds me of the script for Mary Poppins Returns in that the book is almost a retelling of the old story we love so much, but with new skin and fresh eyes. By the way, if you haven't seen Mary Poppins Returns, drop what you're doing and go see it. It's phenomonal. I wondered through most of the book if it was true to his life or not. Turns out the author took well-known facts about his life from biographies and other historical documents, and then took creative liberties with them. And it was very well done. I believe, even though some twists were clearly not factual, they stayed true to the spirit of Dickens, and I kind of feel like he would have loved this book. Note: Top Shelf Text was provided with a copy of this book by the publisher in exchange for an honest review. All opinions are my own! I picked up this origin tale of Charles Dickens’ The Christmas Carol as part of my 2017 holiday reading list. This book moved a little too slowly for me, and for the majority of it I felt Dickens to be unlikable and shallow — unable to stand up to the people in his life and immediately chasing after a new “muse” when his wife leaves him. In the end, the character Note: Top Shelf Text was provided with a copy of this book by the publisher in exchange for an honest review. All opinions are my own! Took me a moment to warm up to this little book, but warm up I did. It is first and foremost a love story. That, I was not expecting. The magical realism too was a sweet surprise. I am a big fan of Charles Dickens. Silva clearly has a love for him too. Mr. Dickens and His Carol is a love story from her to the Boz. Definitely a good choice for my holiday read. I know that this book received a lot of 5 stars and 4stars ratings but I'm afraid that I can only give it 2 stars. This novel didn't click with me at all. Dickens was facing losing everything because his last book, Martin Chuzzlewit, was a complete flop. His publishers told him he had to write a successful Christmas book to save his career. He suddenly feels that everyone is after his money and his surly behavior plus his getting in contact with an old girlfriend in a search to find his muse, drives his wife to take the children and go to her mother's in Scotland. Feeling abandoned, he takes up quarters where his writing career first began. While walking the streets of the area, he comes across a lady in a purple cloak named Eleanor Lovejoy, and he determines that she is his new muse, having apparently put his wife and children out of his mind for the moment. He is infatuated with Eleanor Lovejoy and is constantly on the lookout for her purple cloak. She even helps him disguise himself as an old man so that he can walk the streets of London unnoticed. I felt that the Eleanor Lovejoy part of the story drags on and on. Then a totally unbelievable twist is thrown in by the author and with this I felt that the author lost all credibility. I actually found the story contrived, depending on Dickens writing The Christmas Carol to save the day, bring his family back and they all lived happily ever after. Only I know enough about the real Charles Dickens to know that they don't. How enchanting, this book! First of all, I should say I’m a huge fan of A Christmas Carol by Charles Dickens. Also, I have loved a few other imaginative, well-written stories which built upon the original tale and pay tribute to it, such as Jacob Marley’s Christmas Carol by Tom Mula. I was excited to read this new take on it, and Mr. Dickens and His Carol did not disappoint. A magical, endearing story imagining the backstory leading up to Charles Dickens’ writing of A Christmas Carol, as well as How enchanting, this book! First of all, I should say I’m a huge fan of A Christmas Carol by Charles Dickens. I was excited to read this new take on it, and Mr. Dickens and His Carol did not disappoint. A magical, endearing story imagining the backstory leading up to Charles Dickens’ writing of A Christmas Carol, as well as the hurried process, as he was given only a month by his publishers to write a Christmas story. Dickens somehow called forth the inspiration to tell an enduring masterpiece of a story, A Christmas Carol, which is well loved worldwide to this day. This is an interesting novel, weaving a story around the writing of, “A Christmas Carol.” Most books set around Christmas are, usually, disappointing. So I was thrilled to find this, which has more than a nod to the original in the way Dickens himself is disappointed, grumpy and at odds with the world and who finds himself again, through writing a Christmas story. It was, though, a book that Dickens did not want to write. However, “Martin Chuzzlewit,” is not doing as well as expected, Dickens fin This is an interesting novel, weaving a story around the writing of, “A Christmas Carol.” Most books set around Christmas are, usually, disappointing. So I was thrilled to find this, which has more than a nod to the original in the way Dickens himself is disappointed, grumpy and at odds with the world and who finds himself again, through writing a Christmas story. It was, though, a book that Dickens did not want to write. However, “Martin Chuzzlewit,” is not doing as well as expected, Dickens finds himself out of favour, while Thackeray is the man of the moment, and mocking him in public. Under pressure from his publishers, with his wife, Catherine, over-spending on the festive season, his children badgering him for presents, his father and brother asking for money; beleaguered and pressured, Dickens rows with Catherine and is left, alone, to write a book within weeks. In parts, I found this a little silly. However, it has a great deal to recommend it – not least a flavour of the original story, in terms of theme and heart. Charming and a particularly lovely read at this time of the year. It’s hard to believe this is a debut novel. Masterfully pieced together, creative, a great read for December. I really struggled with the writing style but felt I overcame that after some time. Having not read any of Dickens’ work (I know, cringe) I felt like I could still follow this well and understand the allusions and connections that were made, though it does make me wish I knew more about him and his life and more of his works as well. This was an exciting book to read and I look forward t It’s hard to believe this is a debut novel. Masterfully pieced together, creative, a great read for December. I really struggled with the writing style but felt I overcame that after some time. No Bah Humbug from me. I LOVED this Dickens of a tale!!! Such cleverness! Such Imagination! A wonderful cornucopia of fact and fiction, quaint and quirky, humor and humbuggery, truth and tomfoolery. And of course, one can't do Dickens without a ghost or two and "spirited" reverie. Oh but I must warn Dickens purists and literary elitists who do not enjoy romping outside the box of hardline facts. Silva - who adores Dickens - did indeed capture the essence of Dickens and His "Carol", respectfully. No Bah Humbug from me. I LOVED this Dickens of a tale!!! Such cleverness! Such Imagination! A wonderful cornucopia of fact and fiction, quaint and quirky, humor and humbuggery, truth and tomfoolery. And of course, one can't do Dickens without a ghost or two and "spirited" reverie. Oh but I must warn Dickens purists and literary elitists who do not enjoy romping outside the box of hardline facts. Silva - who adores Dickens - did indeed capture the essence of Dickens and His "Carol", respectfully. However, she also had a good bit of fun (stretching, twisting, embellishing, rearranging) minute details regarding Dickens' life. And too, some of His more controversial idioms (rumored nuances brought to light) may cause some readers to take offense. In all fairness, keep in mind, Silva (in afterword commentary) expounds upon what portion of the book was based on facts and what was fiction, and why she chose to diddle outside the box. Truly though, all things considered, Mr. Dickens and His Carol is a fabulous FIVE STAR novel . . . . for ME! Maybe it will be for you too. I think I may make reading this one a new Christmas tradition as it was so beautifully written and a very quick read. I would most certainly read this inventive, imaginative novel again and again! I already yearn to be transported back there again. I’m sad it’s over. Trust me you won’t be sorry to pick up this heartwarming read! been looking forward to reading this, a lot of description on some pages but nice short chapters although not based on true life there are some true events I like the twist and the story of how the Christmas Carol was written I can only thank Mr Dickens publishers for putting him under a large amount of pressure as we probably wouldn't have the story now or at least not the version we know and love today. IN WHICH CHARLES DICKENS FALLS IN LOVE WITH A GHOST, WHILE HAPPILY MARRIED. Oh, dear. I don’t even know what to think. I came in wanting the true story behind a Christmas Carol- and, perhaps enchanted by the stunning dust jacket, spent a great deal of money on it. I’m suffering from a bit of buyer’s regret. The writing - style- wit- everything- was brilliant. Scintillating. I am dumbfounded. At first I found a few plot elements- arc- things unexplained- a bit odd, and they heightened my distaste, but then the ¡PLOT TWIST! Jumps in and I was even more dumbfounded- all of it made sense now- that none of it made sense. I did NOT come in expecting historical fantasy. Yep, I’m still huddling, confused, in my corner.